At Jenny's House of Dogs "Dog Training and Grooming", we take care to provide our customers high quality services personalized for their unique needs.Our staff members are professional, courteous and efficient. *** Kevin Linderman is now available for Bird Hunting Training. He comes highly experienced. 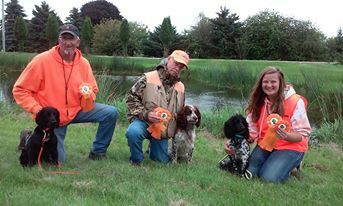 He does Dog Hunting with his own dogs and does hunting tests with AKC and holds many titles through AKC. *** Sonia Callewaert will be teaching puppy and basic classes. Sonia is new to the Antigo area, but she is assisting me with running the 4H Dog Project. Sonia moved here from Racine WI where she also helped with the 4H Dog kids for the past 2 years. 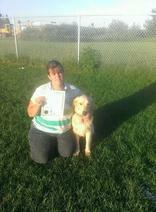 Both of her dogs have their CGC certificates and Jackson her Golden has his star Puppy and TDI. Both of Sonia's boys show her dogs in Obedience, Rally, Agility and Showmanship. She also is a CGC evaluator.